Battery technology is a vital part of all aspects of today’s society, but we still lack a basic understanding of some of the processes involved in energy storage. Studying the local electronic structure is key to this understanding, and one tool used to do this is x-ray spectroscopy. Using this apparatus that was developed by at the University of Washington Physics and Clean Energy Institute it is possible to perform in situ x-ray spectroscopy of battery fatigue over many discharge cycles. Previously, x-ray spectroscopy has only been possible at synchrotron beamlines, so a long baseline study like this would have been impossible without the XANES apparatus. Operando X-ray Absorption Near Edge Spectroscopy (XANES) is an analytical technique used to elucidate the local electronic structure of an atom as it evolves throughout a reaction or electrochemical process. Frequently, this technique is implemented to track changes to the oxidation state of electrochemically active elements in real time. As a result, interest in operando XANES has developed in the fields of electrocatalysis and battery research where it may serve to probe reaction mechanisms and guide cathode development, respectively. The principal event studied in X-ray Absorption Spectroscopy (XAS) is the absorption of a photon. In this process, an electron interacts with the field of an incident x-ray to acquire a time dependent acceleration. The electron may then be promoted from a core-orbital to an unoccupied bound or continuum state with an intensity given by Fermi’s Golden Rule1. By varying the energy of a monochromatized beam of incident photons, a spectrum of the absorption cross section may be generated and analyzed to determine the probed unoccupied density of states. The probability of an excitation sharply increases when the energy of the incident photon reaches the binding energy of a core-electron, in XAS, this is referred to as an edge. As the binding energy of core-electrons in various metals is often well separated, this makes XAS element-specific, an attribute that greatly increases its utility. 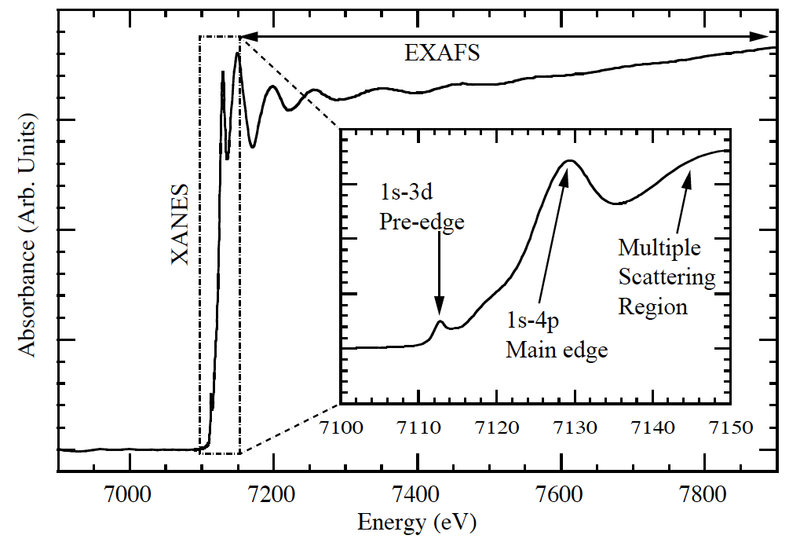 Furthermore, XANES is a subset of XAS in which the local electronic structure is characterized by investigating the absorption cross section within 50-100 eV of an edge. The XANES region is sensitive to a wealth of electronic structure information, which may be analyzed in three sections. Before the edge, the intensity of pre-edge features is greatly affected by the coordination geometry of the central atom2. At the edge, formal oxidation state may be qualitatively assigned as the energy of the edge position is not an invariant quantity for a given element, but rather shifts in accordance with electron density2. Finally, coordination shells are interrogated just beyond the edge as the emitted photoelectron scatters off neighboring atoms2. While the above qualitative features are amenable to cursory analysis, theoretical simulations of XANES spectra are exceedingly difficult. This is due to the large mean-free-path of the photoelectron at low-k2 as well as multiplet and core hole effects1. Nonetheless, such calculations are achievable with multiple-scattering3 and TDDFT4 codes, which serve as a powerful tool for analysis beyond the fingerprints discussed above. Instrumentation utilized to acquire XANES spectra must provide high flux, energy-resolution and stability to yield meaningful results. Flux considerations are critical for operando experiments. In counting experiments, results are governed by Poisson statistics and integration times must be chosen to minimize subsequent noise. Nonetheless, in an operando XANES experiment, acquisition times must not exceed the timescales relevant to the electrochemical process of interest. Flux requirements must then be met with intense sources and efficient instrument design. Similarly, if the results of an operando XANES experiment are to be useful, they must not only be acquired in a reasonable time frame, but acquired with sufficient energy-resolution to distinguish differences in sharp spectral features. In modern designs, this is achieved with the aid of a spherically-bent crystal analyzer (SBCA). Finally, in an operando XANES experiment, repeated scans are necessary to interrogate the electronic structure of the compound at various stages of the electrochemical process of interest. For that reason, instrumental stability is of paramount concern to maintain the fidelity of results. While operando XANES is a robust technique requiring minimal sample prep, there are several thickness, concentration, and compositional criteria that must be met to permit a study. First, a sample must be homogenous across the beam spot. Second, it is important to note that the concentration of the sample will dictate available methodology. Generally speaking, dilute samples must be measured in fluorescence mode and require a synchrotron light source, on the other hand it is possible to measure concentrated samples in transmission mode with either a synchrotron or laboratory-based instrument. Similarly, sample thicknesses should be chosen such that the sample is one to two penetration lengths thick. When planning a study, there exist several resources, such as Hephaestus5, that can help guide sample design decisions. Finally, operando experiments generally require some form of containment or outer cell. In such instances, it may be necessary to design windows and other cell components to minimize photon absorption. The mechanisms governing sulfur redox chemistry in Li-S batteries have been studied via operando XANES measurements performed by Cuisinier et al at the Advanced Photon Source (APS)6. In this study, sulfur speciation was continually monitored upon cycling and compared to an assortment of reference compound spectra. This approach permitted the investigation of under-utilization of cathode material and sulfide precipitation, two important considerations in further developments of Li-S batteries. Nowak et al investigated the lithiation kinetics of nickel cobalt aluminum oxide cathodes with operando XANES7. These measurements were performed in a full-field microscopy set-up to attain sub-particle resolution over an extended region. This configuration reduced sample integration times and consequently the radiation dose received by sensitive components, such as the electrolyte and binder. Applying linear combination fitting to Operando XANES results enabled Kornienko et al to study the speciation of a CoS2 catalyst during the Hydrogen Evolution Reaction (HER)8. These researchers found the oxidation state of Co and S to be unchanged, however an increased satellite intensity was observed in the former and may be attributed to greater p-d hybridization. G. S. Henderson, F. M. F. de Groot and B. J. A. Moulton, Rev Mineral Geochem 78, 75-+ (2014). A. Gaur and B. D. Shrivastava, Review Journal of Chemistry 5 (4), 361-398 (2015). J. J. Rehr, J. J. Kas, F. D. Vila, M. P. Prange and K. Jorissen, Phys Chem Chem Phys 12 (21), 5503-5513 (2010). G. te Velde, F. M. Bickelhaupt, E. J. Baerends, C. Fonseca Guerra, S. J. A. van Gisbergen, J. G. Snijders and T. Ziegler, Journal of Computational Chemistry 22 (9), 931-967 (2001). B. Ravel and M. Newville, Journal of Synchrotron Radiation 12 (4), 537-541 (2005). M. Cuisinier, P. E. Cabelguen, S. Evers, G. He, M. Kolbeck, A. Garsuch, T. Bolin, M. Balasubramanian and L. F. Nazar, J Phys Chem Lett 4 (19), 3227-3232 (2013). L. Nowack, D. Grolimund, V. Samson, F. Marone and V. Wood, Sci Rep-Uk 6 (2016). N. Kornienko, J. Resasco, N. Becknell, C. M. Jian, Y. S. Liu, K. Q. Nie, X. H. Sun, J. H. Guo, S. R. Leone and P. D. Yang, J Am Chem Soc 137 (23), 7448-7455 (2015).